"Oh no! We are late and we are going to miss the babi guling!!" I was a little bit upset because the ladies took too long shopping for souvenirs at Kumbasari Market and scouting for stone carved statues at Batubulan. 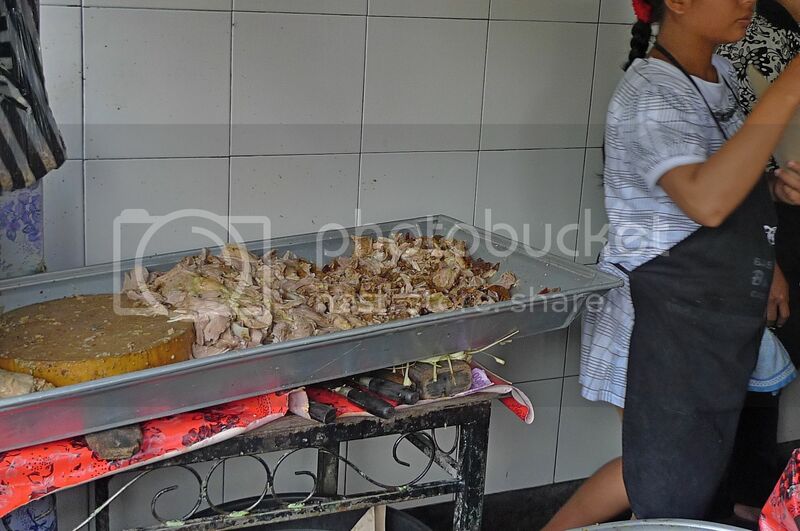 According to our driver, people would start queuing up for the babi guling (roast suckling pig) at one of Bali's most famous restaurant, Warung Ibu Oka, as early as 11am. And since they sell a limited number of pigs a day, chances are by the time we reach there the babi guling would be all sold out! OK, I was in fact, really, really upset. I had already missed the sunset at Tanah Lot, I was not about to miss the babi guling!! Seeing the sunset at Tanah Lot and eating babi guling were two of the most important agendas I had in mind for this Bali trip! Our driver tried his best to drive as fast as possible to reach Ubud. Once we entered Ubud, I could sense a sudden change in the atmosphere. 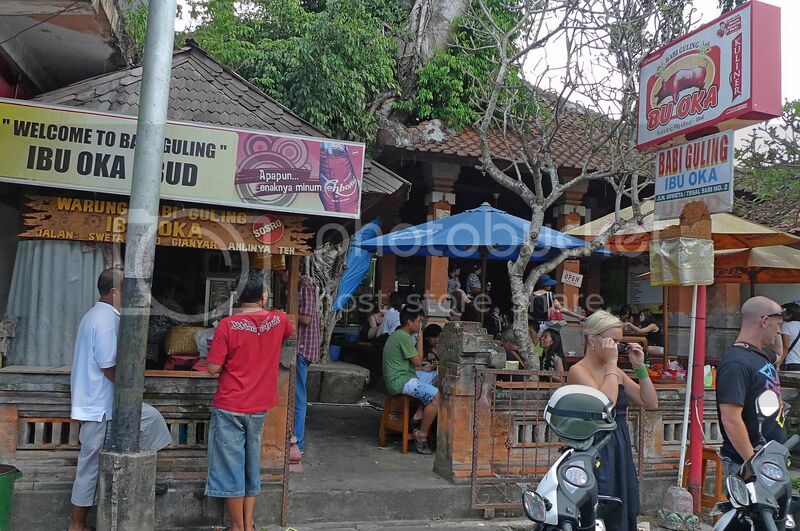 We passed through the Ubud village and a feeling of calmness enveloped us. I was not that upset anymore. Somehow, Ubud seemed to have a certain magic that charmed all of us! We reached Ibu Oka at about 1pm. I prayed they still have babi guling left for us! This is the front entrance to the restaurant. 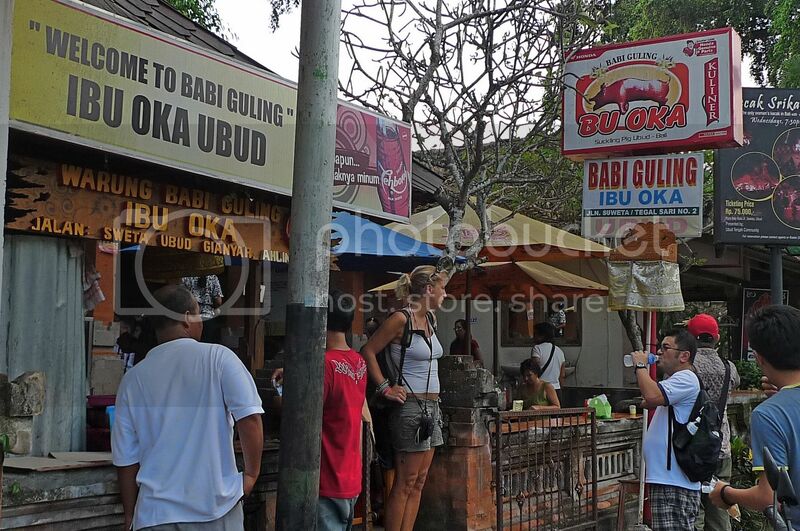 They say the best food in Bali is babi guling. And the best babi guling is found at Warung Ibu Oka in Ubud. 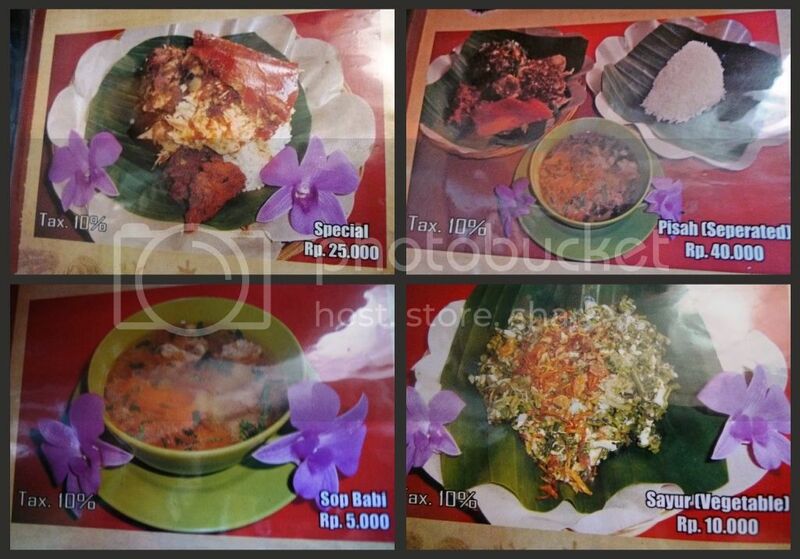 Located at Jalan Suweta, Warung Ibu Oka has been serving satisfied customers for more than 20 years! Wow! Is that a pretty long time or what! 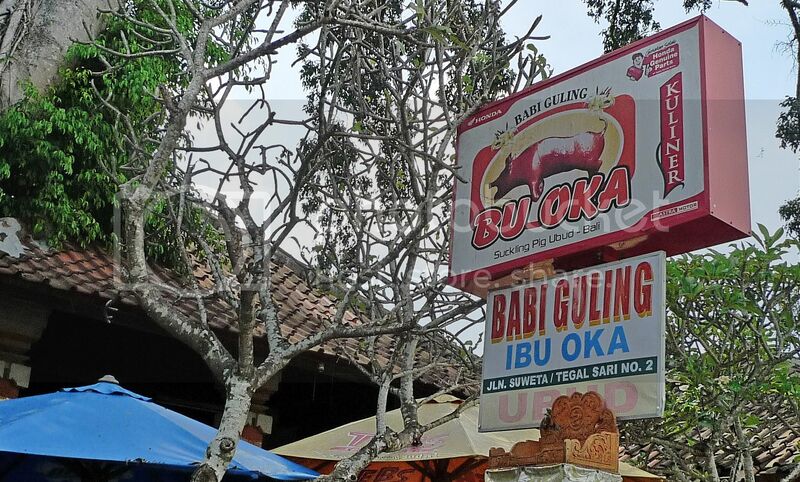 Even more amazing, Ibu Oka had learnt the art of cooking the babi guling and running the business from her parents-in-law who were selling babi guling at a local market for more than 30 years before she took over. After her parents-in-law died, Ibu Oka moved her business to Jalan Suweta and renamed it as Warung Ibu Oka. She had not looked back since. As we entered the restaurant, we passed by this "kitchen" at the entrance and saw that they still have lots of babi guling left. What a relief! I learnt that half a dozen pigs are housed at the back of the compound ready to be slaughtered at 4am every morning before the restaurant opens at 11am. At least 4 pigs are slaughtered to satisfy the droves of hungry customers streaming into the restaurant daily. There were a lot of people in the restaurant, but luckily we managed to find an empty table right at the back! Yes, all diners sat on the floor as you can see in the photo above. 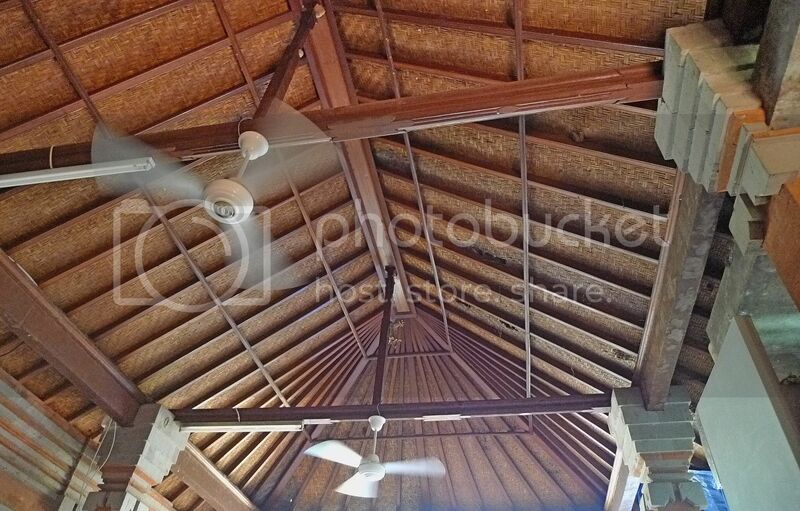 Luckily, they have ceiling fans here otherwise we would be sweating like pigs! Haha! 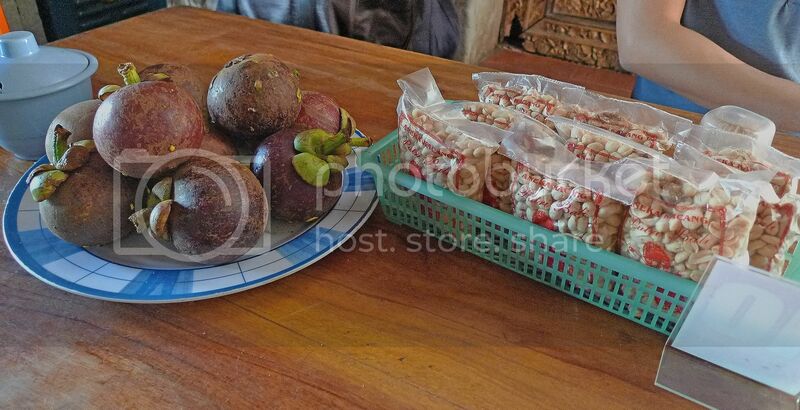 There were mangosteens and nuts on our table. I ate one mangosteen and it was so juicy! So while waiting for the waitress to take our orders and for our food to arrive, we feasted on these delicious mangosteens! We ordered the Special each. The Special is the best way to eat babi guling if you are a first timer to this restaurant as it consists of everything that includes the pork meat (daging), skin (kulit), fried fats (gorengan), sausage (sosis), vegetables (sayur) and rice, except the soup (sop babi). We did not order the soup although I should have just to give it a try! You can also order everything separately the ala-carte way. We ordered for additional fried fats and skin. All of us unanimously agreed the fried fats and skin were so crispy and delicious, but ooh, so very unhealthy!! Can you see the pork meat, skin, fried fats, sausage, vegetables and rice in the Special above? Here's another photo with flash. The babi guling was really yummy! If you ever go to Bali, you must not miss this restaurant! So what's the secret behind Ibu Oka's delicious roast suckling pig? Well, here's what I learnt. The pigs are killed every morning so you get fresh pork and not overnight ones. 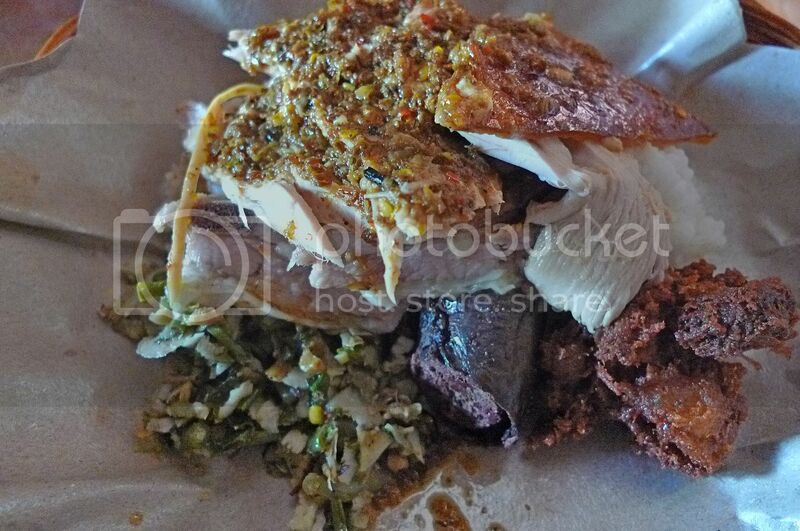 Then they are packed full with Balinese herbs and spices before being roasted over an open fire for at least 5 hours! Yes, I am not kidding here! 5 hours of hard work as the cooks have to rotate non-stop, the wooden spit by hand, regularly dousing the flames with water to maintain the perfect cooking temperature at all times! We ended up spending about 45,000 rupiah (RM17) each, which was definitely worth the money! Even as we left, we could see lots of customers continued to arrive in droves waiting to satisfy their hunger for Bali's No. 1 food, the babi guling. ahhhh look so yummy!! dammit! im having my lunch now still craving for this one!! the place look so nice wor. wow sit on the floor summore. :)) like korean style aye. again, not stalking u k. i opened blogger and am actually 59seconds late kay. LOL! RM 17 only??!!! woot?! SO CHEAP?! its yummy but so pity those pigs were killed. lol. btw, y dnt try the soup??? lol oily?? or wat?? Omg babi guling ^@^ So cute name wont feel guilty to eat ar haha. rm17 per person is really cheap. Ah..all for the love of babi guling! :) Better than the roast suckling pig served here? oooohh..first time i heard of of rolled pig.. must try, must try.. kiv this! i bet many of my hungry frens never tried this before! I think knowing that the pigs are being slaughtered right there would have made me lose my appetite. Wep...onto the mangosteen. You guys have no idea how fortunate you are to have all these fresh tropical fruits. Tropical fruits such as mangosteens and durians are expensive in the U.S. and they're frozen. As a matter of fact, most people from here that travel to Asian countries eat tropical fruits more so than any other foods when visiting. How long was you in Ubud? When I went to Bali, I originally planned to spend 2 nights there. In the end I extended for another night. I liked this town very much. yeah very oily but i still wanna try!! and extremely spicy ya the chilli sauce!!! wow! i must mark this place down when i go bali in oct!!! You won't miss a single thing if you travel with me, haha! What are you actually have in mind for our upcoming Cambodia trip. You never told me anything. I would like to have babi guling as well! Looks yummy to me! Babi guling, have to wrestle with the piggy like in WWF before cooking! ha ha ha! LOL! 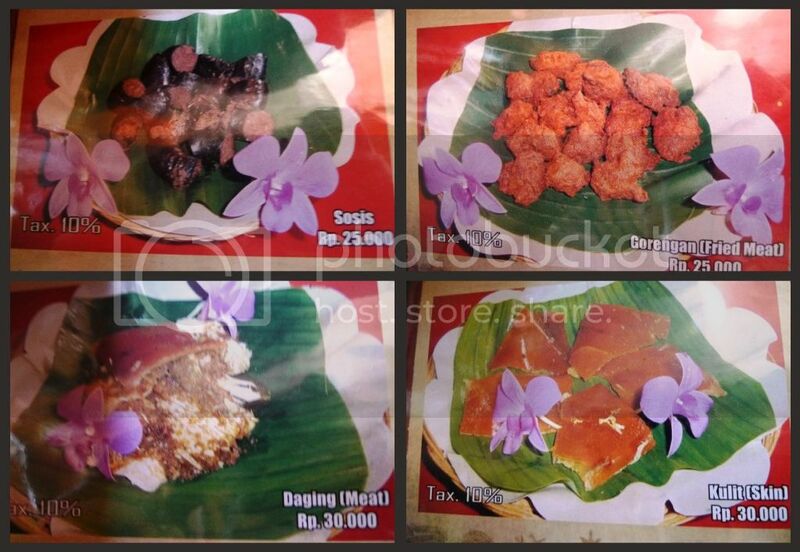 You reckon this is Bali's #1 food, oink oink guling. Thankz so much for the pixs, plus the history of Ibu Oka and her secret recipe. Must not miss this place when we go to Bali right on. ~;)tQ. haiz, don't mention about babi guling anymore!! this is the most famous food in Bali, and yet i didn't have a chance to savour!! what a shame of me!! don't you think so?? because we didn't have enough time for that, the driver brought us to eat bebek bengkil, and then when we ask about babi guling, he just say it's too far to go there!!! can you believe that?? 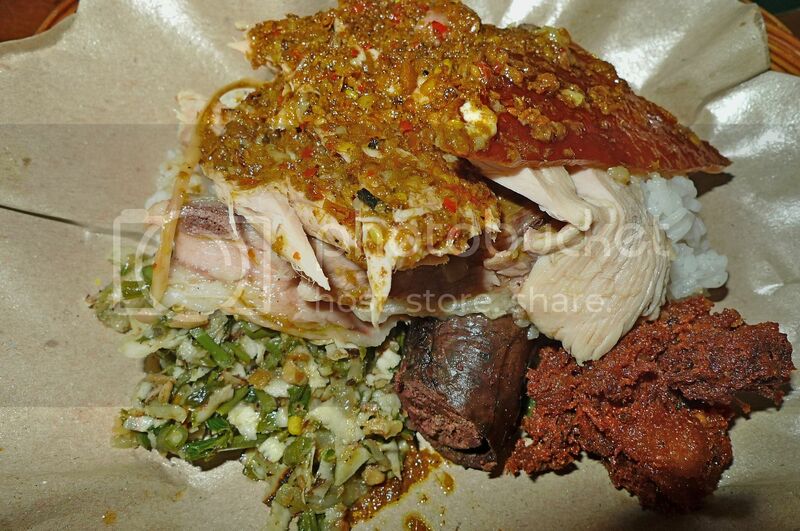 just because of that, we missed this famous and delicious food of Bali!!! the photo you've taken looks so nice and yummy, i want to eat babi guling!!! so that give me a valid reason to go back to bali again!! because i must eat babi guling the next time i go bali..
this i promise myself.. i must eat babi guling if i ever visit bali again.. Wait, I doubt they're suckling pigs though, being much much larger than the ones we have in Chinese diners. And with thicker skin, that's why some of my travelling mates did not like the roast pig, as much as I did. I find the meat very tasty, infused with the spices and being more tender than the average roasted pork. I saw an episode of Antony Bourdain's show where he raved about this abi guling too. Wow...you guys ordered all the dishes available in the menu? Goodness. I am sure you guys are stuffed to the max at the end. 45,000???? how much is 1 RM in dollar? by the way, just wanna ask.. the address written in the package that you have sent to me.. is it your mailing address? if not, can you send it to mee via facebook? Oh oh babi guling or roasted suckling pig. It seems that it is really yummy for you to get upset not tasting it. Oh how I wish I could go to Bali now and taste babi guling. i got the jusco voucher already!!! already reached my company for some times, but no one go collect, because no one hint.. =.="
caroline ng, can't go back to this restaurant the next day cos we have planned something else at another place, that's why so upset when the ladies took too long shopping! rosebelle, well you won't see the pigs being slaughtered. But why would eating pigs be any different than eating say, chickens? Or fish? khengsiong, oh you must try it next time! I was in Ubud just for one day - too short!! Next time, I want to stay in Ubud! It's a nice place better than most other places in Bali, I think! iamthewitch, the mangosteeens were not free! I initially thought they were free too, haha! Yes, let's go together next trip cos I don't mind eating babi guling again, and I need to re-visit Tanah Lot, plus I have yet to go Uluwatu to see the beautiful sunset and watching the kecak dances! fufu, I knew you have tasted this babi guling cos you traveled so widely haha! It's OK to enjoy the babi guling no matter how unhealthy once in a while. It's not like we are eating it everyday! LOL! daydreamer, yes you must! Btw, how come I cannot access your blog? SK, never mind, follow me to Bali next time and we can eat babi guling! merryn, of course must kill the pigs first if not how to cook them? Haha! bluedreamer27, yes agree too much red meat (eg pork) is bad for health. I seldom eat pork, only once in a while and during holidays, I normally throw caution to the wind! Haha! Really? Philippines' pigs are the best? Why? 45,000 rupiah = USD5. Good price? Hey, thanks for the post. 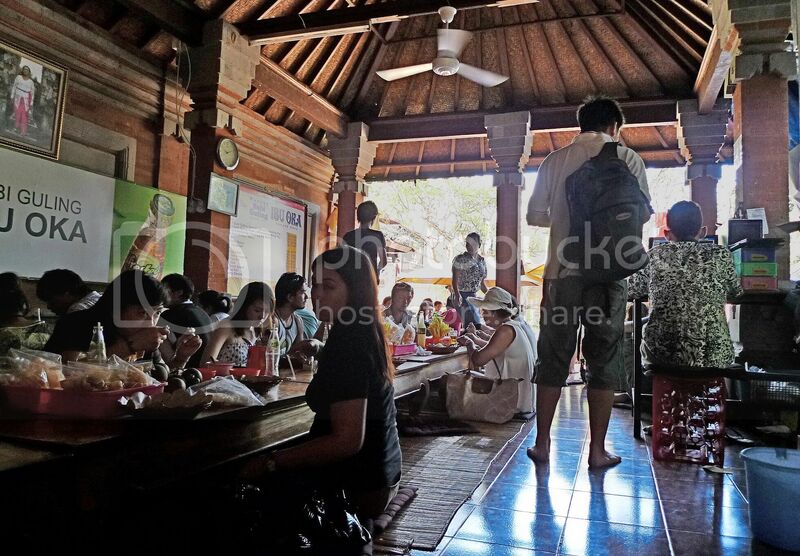 I’m really surprised to see people sitting on the floor and having the food especially in a tourist destination. I hope you had a lot of fun there and enjoyed the dish with so many people together. Bye. 5USD??? oh not bad.. it's P220 here... so you convert your money to rupiah before going to Bali?? haha yeah i am planning to buy a gift tomorrow... just a small gift... thanks foong..
Glad you had nice babi guling. I was there in 2005, just after the bombing, I didn't dare to wonder too far. bluedreamer27, yes changed to rupiah before I leave for Bali. I must try the suckling pig in Philippines since it's so highly rated, haha! che-cheh, how come you are not sure? Have not booked the flight yet? post.The dishes are seem very delicious and it felt me hungry. You have to sit on the floor to have your lunch or dinner,I can't imagine it in such tourist place.Anyway the dishes are really very delicious. Thanks for sharing,good shots also.